The concept of first do no harm has been a foundation of medicine for ages. But now we’re learning doctors and others caring for the nation’s war heroes may actually be doing more harm than good. News Anchor: The concept of first do no harm has been a foundation of medicine for ages. But now we’re learning doctors and others caring for the nation’s war heroes may actually be doing more harm than good. Correspondent Douglas Kennedy continues our look at the toxic combination of veterans and too many drugs. Douglas Kennedy: It was in 2009 when former Navy Corpsman, Kelli Grese, first overdosed on the medication prescribed to her by a doctor from the Department of Veterans Affairs. Her sister, Darla, says the problem seemed obvious. 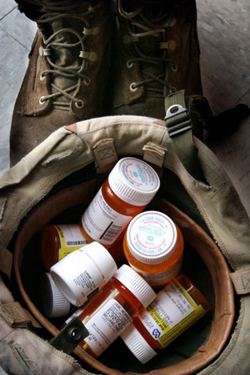 In your opinion, VA doctors were writing too many prescriptions for too many drugs. Darla: Absolutely. They are dispensing pills by the hundreds. Douglas Kennedy: And told them to stop prescribing her all these drugs. Darla: I did, and actually at one point in 2000, I actually, uninvitingly busted into the Chief of Staff’s office and begged him to stop his physicians from prescribing pills. Douglas Kennedy: But the doctors wouldn’t listen to Darla and in 2010 Kelli died of an overdose. Her stomach full of drugs now increasingly used by the VA and military for uses not approved by the Food and Drug Administration. VA doctors for instance, gave her the Seroquel for the unapproved symptom of insomnia and Adderall is only approved to treat attention deficit disorder, a condition which Kelli did not have. Douglas Kennedy: Robert Haddad is Darla’s attorney who successfully sued the VA in a wrongful death lawsuit. Robert Haddad: Thousands of drugs being dispensed everyday for purposes that they were never intended to be used and having a devastating effects on the vets. Douglas Kennedy: The VA refused to comment on Kelli’s case directly, but in court papers maintain the monetary settlement with Darla was not, quote, “an admission of liability or fault on the part of the United States.” The VA says your sister’s death was not the fault of VA doctors. Douglas Kennedy: What do you say? Darla: I say, it infuriates me. I think her death was inevitable and any human brain could not sustain the chemicals that they were giving her. Douglas Kennedy: She says the VA is using drugs off label to mask the problems that soldiers face when they complete their duty. In Virginia Beach, Virginia, Douglas Kennedy, Fox News.